Breathe in the crisp Southern Australian air bound for Adelaide. Enjoy private touring, before lounging on the Indian Pacific. Experience the quaint ‘big-little’ town life of Adelaide. Sip your way through the Barossa Valley and scenic Hahndorf. Sail the seas on the award winning Radiance of the Seas traversing the South West coast. Your private cabin aboard the iconic Indian Pacific awaits. 5 nights aboard Radiance of the Seas from Perth to Adelaide with a port of call in Esperance. Your cruise includes on board meals and entertainment. Transfer from the cruise terminal to your hotel with a Half day Adelaide City Sights tour. 4 night stay in Adelaide at Holiday Inn Express Adelaide including breakfast. Full day Barossa Valley and Hahndorf tour. Transfer from your hotel to the Adelaide Parklands Terminal for dinner. 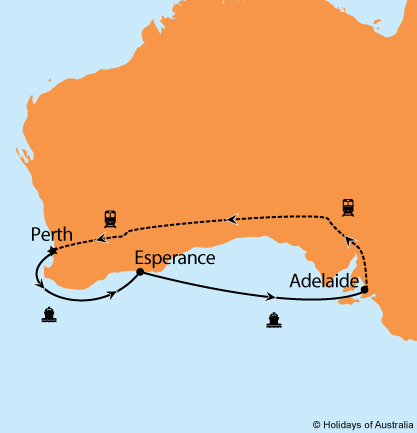 2 nights aboard the Indian Pacific from Adelaide to Perth in Gold or Platinum Service. Includes all meals, drinks and off train experiences in Cook and Nullarbour. Images courtesy of GSR, Princess Cruises & SA Tourism.